If you will doing lots of heavy-duty tasks in your garage or if your business requires you to do so, maybe it’s time to invest on the right air compressor. Husky 80 Gal. 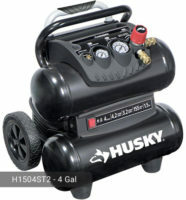 5-HP 2-Stage Air Compressor has been proven to be a good investment both for home owners and industrial businessmen. The air compressor pump is made of solid cast-iron for durability and longer machine life. 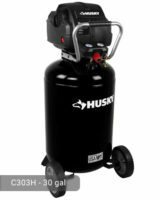 Husky 80 Gallon Air Compressor HS5181 model can deliver 14 SCFM of air at 90 psi making it efficient for both light and heavy-duty activities. The maximum pressure is at 175 psi. There is a pressure cut-off switch which will automatically turn the pump off once it has reached the maximum level. Coupled with a 5-HP induction motor, the power output of this compressor is very much superior to other models. The pump is oil-lubricated so you can expect the parts to be long-lasting and functioning smoothly. It can operate at up to 1225 RPM, a very fast rate considering its size. The following activities can be performed quickly because of the air compressor efficiency: spraying, framing nailing, grinding, HVLP painting, hobby nailing, inflation, and sanding. The massive tank can store a total of 80 gallons. It is taller (3 feet tall) than other models with the same capacity which makes it very convenient for leveling during installation. It is made of steel for external protection. Because the capacity is huge, the gauges are also oversized so as to better monitor the performance of the compressor. The tank can power multiple tools and provide an abundant airflow that will maximize their functionalities. It can run 10+ pneumatic air guns and 2 production lines for more than 50 hours a week. Husky 80 Gal. Air Compressor HS5181 offers a dual-stage air compression process. Because of this, the resulting compressed air is guaranteed to be of higher quality than models which have a single stage compression only. The process ensures that the air is free from unnecessary materials such as dirt and moisture which can clog the tubes and hose. There is a changeable air filter that has an automotive style. 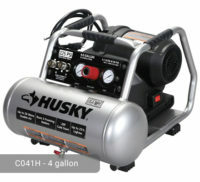 Husky 80 gal air compressor is not portable because of its huge tank. It weighs 458 lbs. 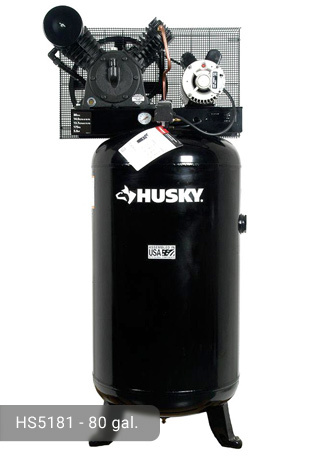 which is expected of an 80-gallon tank capacity air compressor. The tank is vertically oriented so it would not take too much space in your garage. It produces sounds of up to 87 decibels during its operation but they can be tolerated. You would need to plug it to a 240-volt electrical power source to let it start running. It will draw 22 AMPS with this voltage. If it is running on a 208 voltage, it will use 21 AMPS. For 230 voltage, it will use 19 AMPS. During operation, make sure to monitor the vibrations of the air compressor because it might bump with nearby tools depending on its intensity. The vibrations can also cause the air lines to rub against the safety net covering pulleys which can eventually result to holes. As an additional protection for the user and the critical parts of the machine, the Husky HS5181 model has a metal cage protective belt guard. The color may vary depending on the preferences of the user. 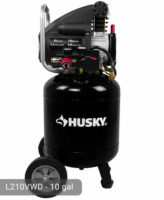 If you want to purchase Husky 80 Gal. 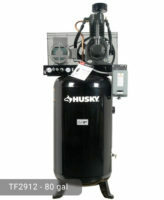 5-HP 2-Stage Air Compressor, visit your local home store now or check online to take a closer look at the machine. It costs from $1,179.00. Although this might seem expensive, the specifications of the machine can justify the cost. Check it out now and start using it for greater results. If you already own Husky HS5181 model or just want to buy it, feel free to share your review or ask a question through the form below.